Chronic cigarette use has been consistently associated with differences in the neuroanatomy of smokers relative to nonsmokers in case–control studies. However, the etiology underlying the relationships between brain structure and cigarette use is unclear. A community-based sample of male twin pairs ages 51–59 (110 monozygotic pairs, 92 dizygotic pairs) was used to determine the extent to which there are common genetic and environmental influences between brain structure and average lifetime cigarette use. Brain structure was measured by high-resolution structural magnetic resonance imaging, from which subcortical volume and cortical volume, thickness and surface area were derived. Bivariate genetic models were fitted between these measures and average lifetime cigarette use measured as cigarette pack-years. Widespread, negative phenotypic correlations were detected between cigarette pack-years and several cortical as well as subcortical structures. 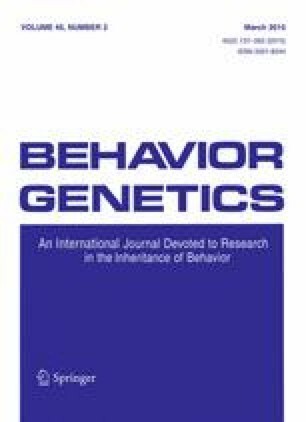 Shared genetic and unique environmental factors contributed to the phenotypic correlations shared between cigarette pack-years and subcortical volume as well as cortical volume and surface area. Brain structures involved in many of the correlations were previously reported to play a role in specific aspects of networks of smoking-related behaviors. These results provide evidence for conducting future research on the etiology of smoking-related behaviors using measures of brain morphology. An erratum to this article can be found at http://dx.doi.org/10.1007/s10519-016-9793-3. Hermine Maes, PI was supported by the grant no. R01 DA025109 05, Michael Neale, PI was supported by the grant no. T32 MH020030 16, William Kremen, PI was supported by the grant nos. R01 AG022381 11, R01 AG022982 04 and R01 AG018386 09, and Michael Lyons, PI was supported by the grant no. R01 AG018384 10. Elizabeth Prom-Wormley, Hermine H. M. Maes, J. Eric Schmitt, Matthew S. Panizzon, Hong Xian, Lisa T. Eyler, Carol E. Franz, Michael J. Lyons, Ming T. Tsuang, Anders M. Dale, Christine Fennema-Notestine, William S. Kremen, and Michael C. Neale declare that they have no conflict of interest. Institutional review boards at the University of California, San Diego and at Boston University approved all protocols, including the MRI scanning protocol. This study was performed in accordance with the ethical standards as laid down in the 1964 Declaration of Helsinki and its later amendments or comparable ethical standards. Informed consent was obtained from all participants.